PT. BARROW, ALASKA -- According to recent reports, homeless elves have been appearing for weeks in the tiny community of Barrow, Alaska, and scientists have finally discovered why: greenhouse gasses have melted the North Pole homestead of Santa Claus, causing the poorly supervised elves to seek food and shelter elsewhere. 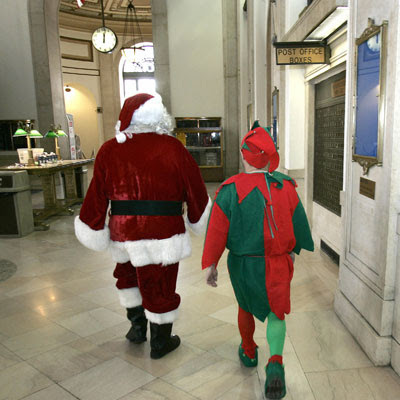 Mr. Claus could not be reached for comment, with his press agent citing 'pressing issues related to Mr. Tiger Woods' black book', but this reporter did manage to speak with an elf who did not wish to be i dentified because he wasn't authorized to talk to the press. "The tops of the castle have been dripping for years and he (Claus) didn't do a thing about it," the seemingly embittered elf claims. "Then, two weeks ago, a wind seemed to come right out of the basement, thereby sucking the entire structure into what is now just a very cold pond." Adds another disgruntled worker, "We can't even fish in it." Sources have also discovered that despite centuries of organization, there is no union protecting the benefits of the Elven workers. "The castle is gone, Santa is gone, and we have nowhere to turn except Hollywood," says Beebus Matzohpelius, Santa's second in command, as he waved from his convertible BMW before heading south. "We're thinking we could make great avatars!" Back in Barrow, the residents seemed to be only mildly disturbed once they recovered from the initial 'elf sighting' shock. Says Cody Hunter, a longtime resident, "Well, we had some polar bears show up in numbers a few years back and that's when we started picking up our garbage and re-using condoms before tossing them. Don't know what to do about the Elves, though... feed 'em to the polar bears, maybe?" Adds Sue Littlejohn, owner of 'Suzy's Cutesy Cuddly Christmas Shoppe,' "I let them sleep outside my shop and feed them candy in the morning so they don't go hungry. And then I beat them because that's how I grew up, and look how swell I turned out!" Another resident of Barrow, also agreeing to speak only on condition of anonymity, s aid the elves behave more like an urban homeless person, such as rattling through garbage cans, falling inside and then screaming for help to get out, singing off-key holiday carols to no one in particular and, adding insult to injury, threatening shoppers with an unpleasant Christmas if they don't provide a donation. "I think the city council needs to take a stand," says local journalist Hank Legolas. "You let one of these little peckers in town, and the next thing you know they have taken over! What is this, the San Diego-Tijuana border?"